Chaitanya Mahaprabhu (1486 - 1534), was a monk and social reformer of the 16th century Bengal, (present-day West Bengal and Bangladesh) and Orissa in India. Sri Krishna Chaitanya was a notable proponent for the Vaishnava school of Bhakti yoga (meaning loving devotion to Krishna / God) based on the philosophy of the Bhagavata Purana and Bhagavad Gita. Specifically he worshipped the forms of Radha and Krishna and popularised the chanting of the Hare Krishna maha mantra. His line of followers, known as Gaudiya Vaishnavas, revere him as an avatar of Krishna in the mood of Radharani who was prophesised to appear in the later verses of the Bhagavata Purana. He was also sometimes referred to by the names Gaura, Sanskrit for 'golden one; due to his light skin complexion, and Nimai due to his being born underneath a Neem tree. There are numerous biographies available from the time giving details of Chaitanya's life, the most prominent ones being the Chaitanya Charitamrita of Krishnadas Kaviraja Goswami and the earlier Chaitanya Bhagavata of Vrindavan. Das Thakur (both originally written in the Bengali language but now widely available in English and other languages) and the Chaitanya Mangala, written by Lochana Das Thakur. According to the biography, Chaitanya Charitamrita, Nimäi appeared on the full moon night of February 18th 1486 at the time of a lunar eclipse. His parents named him 'Visvambhar'- He was the second son of Jagannath Mishra and his wife Sachi Devi who lived in the town of Nabadwip in Nadia, West Bengal. Chaitanya's ancestry is a contentious issue between the people of Orissa and West Bengal with Shree Chaitanya having family roots in Jaipur, Orissa, from where His grandfather, Madhukar Mishra had emigrated to nearby Bengal. Sri Chaitanya Mahaprabhu, also known as, Lord Gauranga was born to Pandit Jagannath Misra and Sachi Devi at Nabadwip, on the full moon (lunar eclipsed) evening of February 18, 1486 (23rd day of the month of Falgun in the year 1407 of the Sakabda era). His father was a pious Brahmin immigrant from Sylhet, Bangaldesh, who settled in Nabadwip in the Nadia district of West Bengal north of Kolkata by the holy Ganges, and his mother was the daughter of the scholar Nilambar Chakraborty.He was the tenth child of his parents and was named Viswambar. Before his birth, his mother lost a number of children. So, he was given the name "Nimai" after the bitter Neem tree as a protection against evil influences. The neighbors called him "Gaur" or "Gauranga" (Gaur = fair; Anga = body) because of his fair-complexion. Gouranga studied logic at the school of Vasudev Sarvabhauma, a reputed professor of 'Nyaya' - the ancient Indian science of law and logic. The extraordinary intellect of Gauranga attracted the attention of Raghunath, author of the famous book on logic - Didheeti. Raghunath thought that he was the most intelligent youth in the world - even more cerebral than his teacher Sarvabhauma. Gauranga mastered all branches of Sanskrit learning such as grammar, logic, literature, rhetoric, philosophy and theology. He then started a 'Tol' or place of learning at the age of 16 - the youngest professor to be in charge of a 'Tol.' Gauranga was a kind and compassionate, and a pure and gentle youth. He was a friend of the poor, and lived a very simple life. While Gauranga was still a student, his father died. Gauranga then married Lakshmi, the daughter of Vallabhacharya. He excelled in knowledge and even defeated a reputed scholar of a nearby province. He made a tour of the eastern region of Bengal and received many valuable gifts from pious and generous householders. On his return he heard that his wife had died of snake-bite during his absence. He then married Vishnupriya. In 1509, Gauranga went on a pilgrimage to Gaya, in northern India, with his companions. Here he met Isvar Puri, an ascetic of the order of Madhvacharya, and took him as his guru. A marvellous change came in his life - he became a devotee of Lord Krishna. His pride of scholastics disappeared. He shouted and chanted, "Krishna, Krishna! Hari Bol, Hari Bol!". He laughed, wept, jumped, and danced in ecstasy, fell on the ground and rolled in the dust, never ate or drank. Isvar Puri then gave Gauranga the mantra of Lord Krishna. He always remained in a meditative mood, forgetting to take food. Tears trickled down his eyes as he chanted again and again, "Lord Krishna, my Father! Where art Thou? I can't live without Thee. Thou art my sole refuge, my solace. Thou art my real father, friend, and Guru. Reveal Thy form to me ..." Sometimes Gauranga would gaze with vacant eyes, sit in the position of meditation, and concealed his tears from companions. So consumed was his love for Lord Krishna. Gauranga wanted to go to Brindavan, but his companions forcefully took him back to Nabadwip. In His eighth year. He was admitted into the Tol of Gangadas Pandit in Ganganagar close by the village of Mayapur. In two years, He became well read in Sanskrit Grammar and Rhetoric. His readings after that were of the nature of self-study in His Own house, where He had found all important books belonging to His father who was a Pandit himself. It appears that He read the Smriti on His own, and the Nyaya also, in competition with His friends who were then studying under the celebrated Pandit Raghunath Siromani. Now, after the tenth year of His age, Chaitanya became a passable scholar in Grammar, Rehotiric, the Smrti and Nyaya. It was after this that His elder brother Vishwarup left home and accepted the asram (status) of a sannyasi (ascetic). Chaitanya, though a very young boy, consoled His parents saying that He would serve them with a view to please God. Just after that, His father left this world. His mother was exceedingly sorry, and Mahaprabhu, with His usually contented appearance, consoled His widowed mother. It was at the age of fourteen or fifteen that Mahaprabhu was married to Laksmhi Devi, the daughter of Ballabha Acharya, also of Nadia. He was at this age considered as one of the best scholars of Nadia, the renowned seat of Nyaya philosophy and Sakskrit learning. Not to speak of the smarta pandits, the naiyaiks were all afraid of confronting Him in literary discussions. Being a married man, He went to Eastern Bengal on the banks of the Padma for acquirement of wealth. There He displayed His learning and obtained a good sum of money. It was at this time that He preached Vaishnavism at intervals. After teaching him the principles of Vaishnavism, He ordered Tapan Misra to go and live in Benares. During His residence in East Bengal, His wife Lakshmi Devi left this world from the effects of snakebite. On returning home, He found His mother in a mourning state. He consoled her with a lecture on the uncertainty of human affairs. It was at His mother's request that He married Vishnupriya, the daughter of Rakj pandit Sanatan Misra. His comrades joined Him on His reutrn from pravas, or sojourn. He was now so renowned that He was considered to be the best pandit in Nadia. Keshab Misra of Kashmere, who has called himself the Great Digvijayi, came to Nadia with a view to discuss with the pandits, of that place. Afraid of the so-called conquering pandit, the tol professors of Nadia left their town on pretence of invitation. Keshab met Mahaprabhu at the Barokonaghat in Mayapura, and after a very short discussion with Him he got defeated by the boy and mortification obliged him to decampt. Nimai pandit was now the most important Pandit of His times. It was at the age of sixteen or seventeen that He travelled to Gaya with a host of His students, and there took His spiritual inititation from Iswar Puri, a Vaishnava sannyasi, and a disciple of the renowned Madhavendra Puri. Upon His return to Nadia, Nimai Pandit turned out a religious preacher and His religious nature became so strongly represented that Avdaita Prabhu, Sribas and the others who had before the birth of Chaitanya already accepted the Vaishnava faith, were astonished at the change of the young man. He was then no more a contending naiyaika, a wrangling smarta and a criticising rhetorician. He swooned at the name of Krishna and behaved as an inspired man under the influence of His religious sentiment. It has been described by Murari Gupta, an eye witness that, He showed His heavenly powers in the house of Srivas Pandit in the presence of hundreds of His followers who were mostly well-read scholars. It was at this time that He opened a nocturnal school of Kirtan in the compound of Srivas Pandit with His sincere followers. There He preached, there He sang, there He danced and there He expressed all sorts of religious feelings. Nityananda Prabhu who was then a preacher of Vaishnavism and who had then completed his travels all over India, joined Him by that time. In fact, a host of Pandit preachers of Vaishnavism all sincere at heart, came and joined Him from different parts of Bengal. Nadia now became the regular seat of a host of Vaishnava Acharyas whose mission it was to spiritualize mankind with the highest influence of the Vaishnava creed. Sri Chaitanya Mahaprabhu began to preach the congregational chanting of the holy name of the Lord at Navadvipa. Some of the brahmanas became envious of His popularity, and they put many hindrances on His path. They were so jealous that they finally took the matter before the Muslim magistrate at Navadvipa. Bengal was then governed by Pathans, and the governor of the province was Nawab Hussain Shah. The Muslim magistrate of Navadvipa took up the complaints of the brahmanas seriously, and at first he warned the followers of Nimai Pandita not to chant loudly the name of Hari. But Lord Caitanya asked His followers to disobey the orders of the Kazi, and they went on with their sankirtana (chanting) party as usual. The magistrate then sent constables who interrupted a sankirtana and broke some of the mridangas (drums). When Nimai Pandita heard of this incident He organized a party for civil disobedience. He organized a procession of one hundred thousand men with thousands of mrdangas and karatalas (hand cymbals), and this procession passed over the roads of Navadvipa in defiance of the Kazi who had issued the order. Finally the procession reached the house of the Kazi, who went upstairs out of fear of the masses. The great crowds assembled at the Kazi's house displayed a violent temper, but the Lord asked them to be peaceful. Lord Sri Krsna, who appeared as the son of the King of Vraja (Nanda Maharaja), is the Supreme Personality of Godhead and is worshipable by all. His instructions to Srila Rupa Gosvami and Srila Sanatana Gosvami, His discussions with Ramananda Raya, the debate with the Mayavadi sannyasi Prakashananda Sarasvati and the Vedanta Sutra Discussion between Him and Sarvabhauma Bhattacharya are the excellent sources through which we understand His teachings in detail. The Lord left only eight slokas of His instructions in writing, and they are known as the Siksastaka. All other literatures based on His teachings were extensively written by the Lord's principal followers, the six Gosvamis of Vrndavana, and their followers. 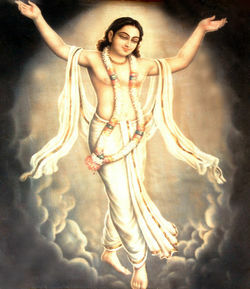 Chaitanya's mission was to preach the importance of chanting the holy names of the Lord in this age of Kali (quarrel). In this present age quarrels take place even over trifles, and therefore the sastras have recommended for this age a common platform for realization, namely chanting the holy names of the Lord. People can hold meetings to glorify the Lord in their respective languages and with melodious songs, and if such performances are executed in an offenseless manner, it is certain that the participants will gradually attain spiritual perfection without having to undergo more rigorous methods. At such meetings everyone, the learned and the foolish, the rich and the poor, the Hindus and the Muslims, the Englishmen and the Indians, and the candalas and the brahmanas, can all hear the transcendental sounds and thus cleanse the dust of material association from the mirror of the heart. To confirm the Lord's mission, all the people of the world will accept the holy name of the Lord as the common platform for the universal religion of mankind. Chaitanya, along with his friend Nityananda, proceeded towards Orissa. He preached Vaishnavism wherever he went and held 'Sankirtans' or religious gatherings. He attracted thousands of people wherever he went. He stayed for some time at Puri and then proceeded to the south of India. Gauranga visited the Tirupathi hills, Kancheepuram and the famous Srirangam on the banks of the Cauvery. From Srirangam he proceeded to Madurai, Rameswaram and Kanyakumari. He also visited Udipi, Pandharpur and Nasik. Up north, he visited Vrindavan, bathed in the Yamuna, and in several sacred pools, and visited the various shrines for worship. He prayed and danced in ecstasy to his heart's content. He also visited Nabadwip, his birthplace. At last Gauranga returned to Puri and settled there.